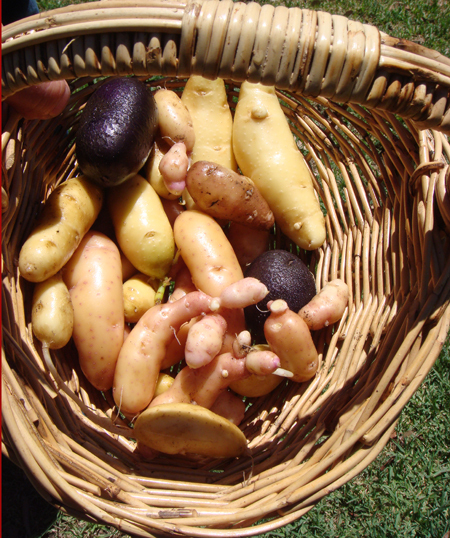 On Christmas Day we harvested the first of our heirloom potatoes and were bombarded by lovely potatoey flavours. The first batch were grown in straw and we need to harvest and store (in hessian or calico bags) the rest of these this weekend, shortly followed by the other ones grown in soil. Planting in straw has been successful but it’s noticeable that the potatoes planted in soil grew with more vigour and overtook those planted in straw. Whether or not this makes a difference in the actual potato flavour remains to be seen when we unearth those in the next few weeks.